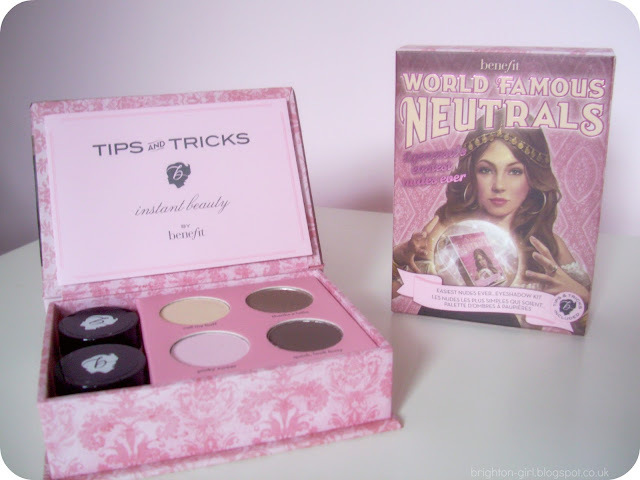 When I attended the launch of Benefit's Fake Up concealer, I was lucky enough to win one of their World Famous Neutrals eyeshadow kits. Each kit is made up of four longwear powder shadows and two creaseless cream pots. I'd seen these popping up on various blog posts before and had my eyes on Easiest Nudes Ever* as the shades seemed really easy to wear. The colours included in this kit are so versatile and can be worn to create an effortless everyday no-make-up look, but also a more dramatic smokey eye too. 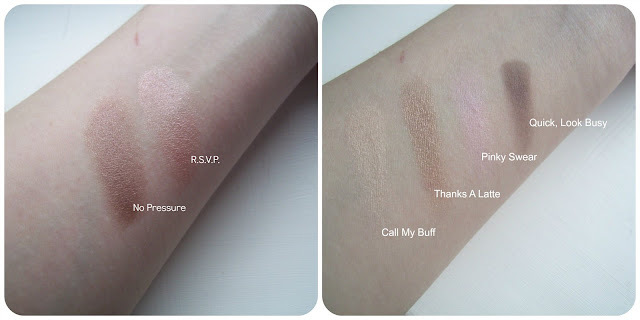 I've been used to using powder eyeshadows and was a little apprehensive about using the creaseless cream shadows. However, I had absolutely no reason to be scared and now love using both shades. R.S.V.P. is a beautiful champagne pinky-peach and is fantastic for days when time is of the essence. A sweep of this across the eyelids using your fingers and a coat of mascara is all you need. No Pressure is a taupey-bronze shade that looks stunning as a base colour in a brown smokey eye. Both shades last all day and are super pigmented. My favourite shade of the powder shadows is Thanks A Latte. It's a fantastic shimmery bronze-brown and compliments my green eyes really nicely. Call My Buff is a great base colour for a no-make-up look. I use it all over the lid and then line my lashes with Quick, Look Busy, which is a matte deep brown. Pinky Swear is probably my least favourite out of all the shades, but it does work really well at highlighting my brow bone. Easiest Nudes Ever is a fantastic kit to have in your make-up arsenal. It would make a lovely gift for someone wanting to start playing around with neutral eyeshadows, but also a welcome addition to any make-up fanatic's hoard! I've been loving combining them with my MAC shadows to create looks. So far my favourite duo has to be No Pressure, with Twinks worked into the crease. I've really enjoyed experimenting with the Easiest Nudes Ever kit, and I've now got my eye on the Most Glamorous colourway too! What do you think of the World Famous Neutrals eyeshadow kits? I'm so jealous, these kits look gorgeous!